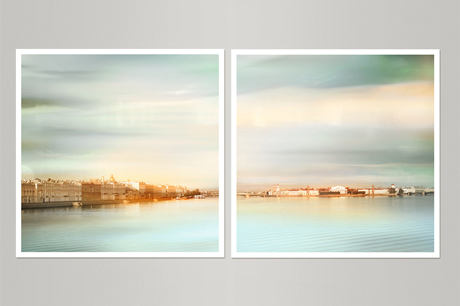 St Petersburg photography wall art set of two pastel prints in mint colors. Minimalist ethereal cityscapes at the water in the light fall mood. The Palace Embankment depicted in the first picture and Old Saint Petersburg Stock Exchange with Rostral Columns of Vasilievsky Island in the other. Square large art prints for living room decor. This diptych is printed on premium archival metallic paper with additional Matte finishes, which coats it from water, UV, fading and scuff damage and no need a glass protection. Prints on pearl paper with matte finish have a nice silvery effect.